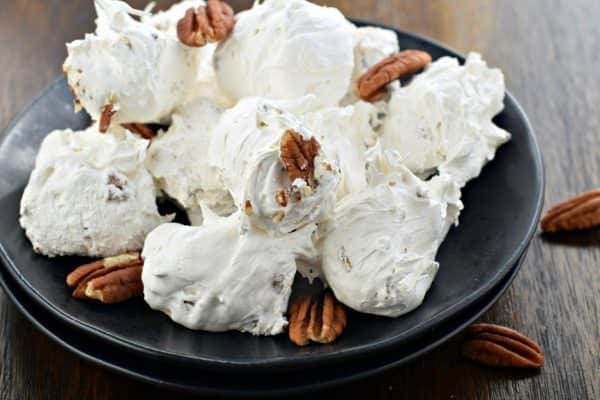 If there’s ever one standout recipe request that I receive, it’s always for the ever popular southern treat, Divinity. Here’s the thing though. I’ve never had Divinity, let alone made Divinity, so this one took some research. I wasn’t sure what the texture should be, so a quick search on google revealed that it’s in the marshmallow, fudge, and taffy family. I quickly set out to give this a try, and if I’m being honest, my first attempt was a fail. There is a lesson to be learned from me…don’t rush it. In your final step, you need to beat the mixture for about 6 minutes, until it loses it’s glossy finish. You want to be able to scoop some out of the bowl and it will stand on it’s own. My first attempt spread into a puddle on my baking sheet after several minutes. However, once I repeated my attempt at making this, without rushing, it was a huge success! If I were to describe the texture, I would say once you sink your teeth into the candy, it’s got a fluffy texture like a homemade marshmallow. However, as you continue to bite into it, you’ll find a soft fudge like texture is revealed. I didn’t think “taffy” described this well…as my first attempt was more of a taffy…that spread and was too soft. A soft, tender pillow of Marshmallow Fudge would be my description! First, you’re going to need an electric stand mixer. A handheld mixer will not do the job on this one, as you need a little higher power, and you allow it to run for minutes at a time! Second, don’t attempt to make this on a humid day. 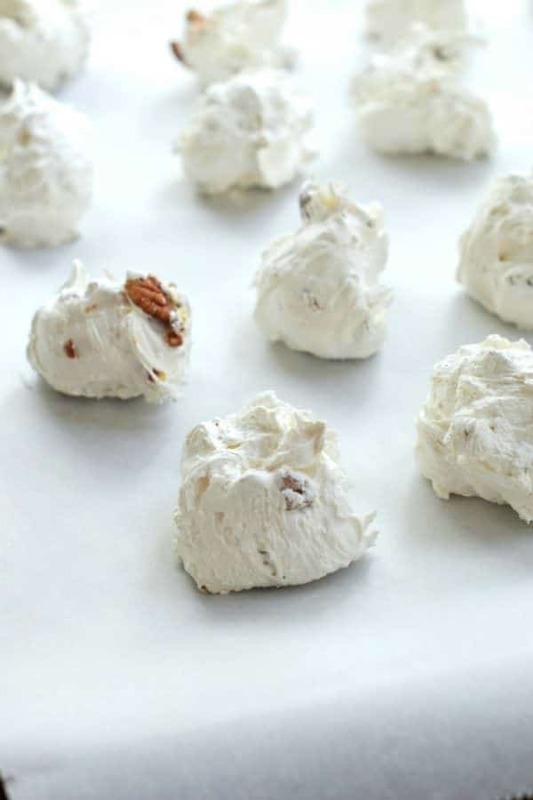 Much like meringue cookies, this candy will not set up nicely if it’s too humid. Or so I’m told! 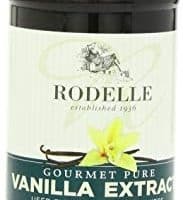 Use a good quality PURE Vanilla Extract (or Almond Extract). This will make the flavor stand out. Check your candy thermometer before using it, to make sure it’s calibrated correctly. To do this, place your thermometer in boiling water for a few minutes. It should register at 212° If it is above or below that, add or subtract the same difference in degrees from the recipe temperature! Also, make sure while you are boiling the mixture, the bulb of the candy thermometer is completely covered with liquid and is not touching the bottom or side of the pan. Store your Divinity Candy in a tightly covered container at room temperature. ENJOY! Divinity Candy is a Southern classic. 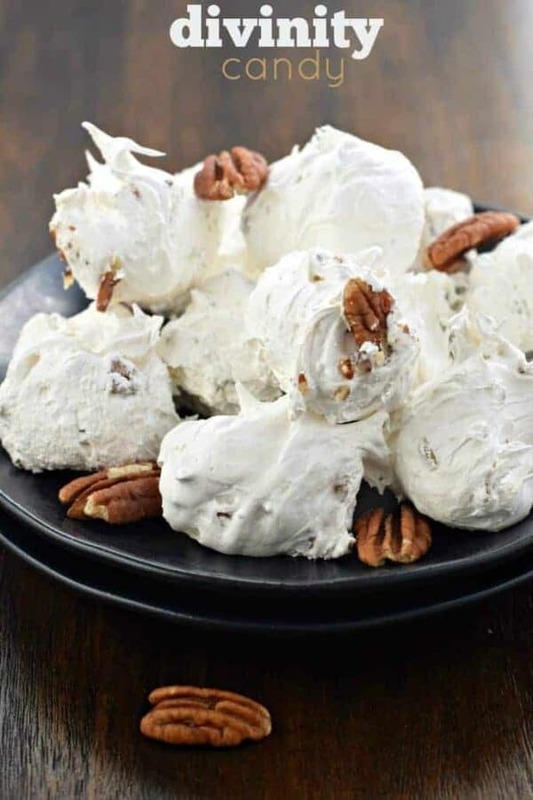 Just one bite and you’ll be hooked on this chewy, soft vanilla treat packed with crunchy pecans! In a large saucepan over medium high heat, combine the sugar, corn syrup, and the water. Cook and stir constantly until boiling. Clip the candy thermometer to the pan and without stirring over medium heat, bring the temperature up to 260°F (hard ball stage). This will take approximately ten minutes. When the candy is nearly to the hard ball stage, begin the next step. In a large mixing bowl, attached to an electric freestanding mixer, beat egg whites until stiff peaks form. Gradually, in a slow steady stream, pour in the hot mixture, beating on high the entire time. This should take about 3 minutes. Scrape the sides of the bowl and add in your Vanilla extract (or almond). Continue to beat on high speed for approximately 6-10 minutes, until the candy starts to lose it’s glossy finish. When the beaters are lifted, the mixture should mound on itself, and not flatten. You can test it by dropping a spoonful onto a parchment paper lined baking sheet. If it stays mounded, the mixture has been beaten sufficiently. If it begins to flatten, continue beating and check again after a minute or so. I completely agree with you on the trial and error of making Divnity. It has signature traits, like the glossy-to-matte transition that you’d never know until making it. It’s such a unique confection and not difficult to make but definitely has quirks! Yours looks delish. 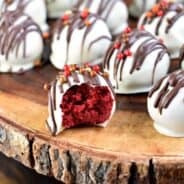 Can I use the candy from the baking section from store? I believe my Mom did and cant remember it. Like small chunks in red, green, so on. I pour my divinity into a buttered 9 x 13 pyrex dish, let it cool and cut it with a knife dipped in hot water. Oooh! I’m going to have to try this!!! My Mom made this a lot . She would add different favors like cocoa for chocolate, coconut , crushed peppermint made it pretty at christmas, what ever she wanted at the time. 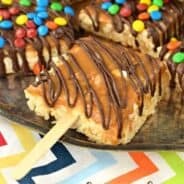 This candy always brings back good memories, thanks for this recipe. Love the memories! I’ll be playing around with new flavors too! So delicious. “MUST USE A STAND MIXER”…..No, you don’t. We have made this (& the microwave version), for 30+ years, using a good handheld mixer & never had a problem! I have used a hand mixer. I have seen my mother (70+ years ago) make it with an old timey crank egg beater for the egg whites & lots of hard work beating the rest. In the early 50s she got a heavy duty Mixmaster. It is the best. . It still works & has lots of power. If I could replace one beater I would still be using it. A Kitchenmaid is not nearly as good. I have one. A Mixmaster bowl turns. It has plenty of room for using a spatula & pouring syrup. It is perfect for divinity. I make it every year. I like to have help spooning it out because I want each piece to be smooth not rough as pictured above. Pieces of red or green dried fruit sitting on top add a festive touch at Christmas. I make this at Christmas when I first start taking it out with a spoon it so nice and fluffy but at the end it looks dry not as pretty is that because I’m not doing it fast enough or did I cook it to long? This looks great and brings back fond memories. My Mom used to make this at Christmas time and I was hard pressed to stay away from it. It’s so good! Thank you for the recipe. One thing of note, water does not necessarily boil at 212 deg F. It will change depending on altitude. 212 is at sea level. Just made this last night as a surprise for my mom. She said it was excellent! I don’t really care for it and am allergic to nuts, but I must say it was a breeze to make. My mixer was pretty warm as well. I had almost given up on it and was cleaning up the mess, and went back and looked again and it was standing in peaks!! Next time I am going to try maple flavor with peanuts, as I am not allergic to them. I’ll let you know if it is a success. Thanks so much for sharing this and all your other recipes???? Maple sounds like a delicious idea!! This is exactly like my Grandma’s recipe, so good! It is not a myth about the humidity if it is raining or even cloudy it will not set up trust me, I know this from experience. This is the exact same ingredients I use in my recipe which was passed down from my Mom from her Mom. The originl was gotten out of a Jewel T cookbook. The only difference is we cook our syrup to softball stage, put 1/2 in the egg white mixture and then cook the remaining half to hardball stage. This was one of my Mom’s favorite candies. made this in the 50s and still remember that Taste. will do this this year, its just so Good. This looks so delicious, and it would be so pretty for Christmas, I am going to try it, hope it turns out for me! Oh my. You all crack me up. You do know a recipe is a suggestion and you can use whatever mixing device you want. Nothing has to be done exact. If you don’t like kitchen aid then don’t use it. The only thing you can’t do is make it when it’s humid out. This recipe is science and moister is an enemy. Just say thank you for the recipe and move on. 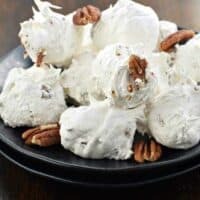 I have been making divinity from a family recipe (same recipe as this one) for at least 30 years. Never had a standing mixer, I use my good quality hand mixer and just mix for 5 minutes or so after mixing in the syrup. Then I switch to a wooden spoon and incorporate air while I stir the mixture – it just needs to cool down to thicken enough to drop from spoon. Also, I bring the syrup to 250 degrees – 252 on humid days (I’ve made divinity on many humid days). 260 degrees seems way too high. 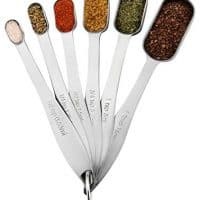 Also, if the mixture gets too hard when you are spooning it out and not soft and pretty looking, add a few drops hot water and stir, it will fix it. Divinity doesn’t keep well, but I have discovered that it freezes very well. Just freeze in single layer on a cookie sheet, then stack carefully (once frozen) in a container. Divinity is my favorite candy, particularly with black walnuts. When I was much younger, I would try every year to make it for the holidays and always had a flop. Our farm family was very conservative and if possible didn’t waste anything. I learned if it didn’t set up I would put those little sticky patties in the freezer until solid, then dip them in chocolate yummy. I don’t know how many people asked me for my Valomilk candy recipe. One day I decided to make it right if it took all day. The first time I managed to cook it to the right temperature and realized the change in texture was the key. Now it is my “go to” anytime I need to take treats to work or for community bake sales. Every year I make at least 10 lbs. For Christmas gifts. My recipe is exactly like yours. My Grandmother and the my Mother would make divinity for Christmas every year. Now I make it every year at Christmas time. My recipe is very similar. The only difference is you add 2-3 Tbsp. of Cherry jello to the egg whites once they are beaten to stiff peaks. I have also used Lime jello. Depending on what flavor you want you can use any flavor. Just omit the vanilla. The red and green are a pretty combination. Ohh I love that idea, thank you! I have a stand mixer now, but I have burned up one hand mixer over the years. It set up quickly so be ready when it looses that gloss to put it by tablespoon out on wax paper. Karmella made. Syrup cooked to softball, half added to egg whites remaining syrup mixture cooked to hard ball then added to egg whites to finish mixing. could not endure. Humidity, glossy and peaks are all key words in this recipe. My grandmother was 93, my mother was 98 and I just turned 70 we all enjoyed making this special Christmas treat. Thank you for sharing your expertise. This recipe is THE BEST! I’ve failed at this so many times and NAILED it this time thanks to you. I even remarked to my husband, before making your recipe, “This is the year that I conquer Divinity!” Thank you so much! When it is humid I remove two tablespoons of water and my divinity stands up. I once was given divinity fudge that was so very light in weight . Is this done by adding more egg whites to the mixture ? Love your recipes ! Just looking at this and reading the instructions is making my mouth water. Next non-humid day, I’m going to try this (again). It is just so deliciously delicious! Thanks for the recipe and insider notes. I grew up making this with my mom, along with English toffee, pralines, fudge, angel candy, bourbon balls, and more. 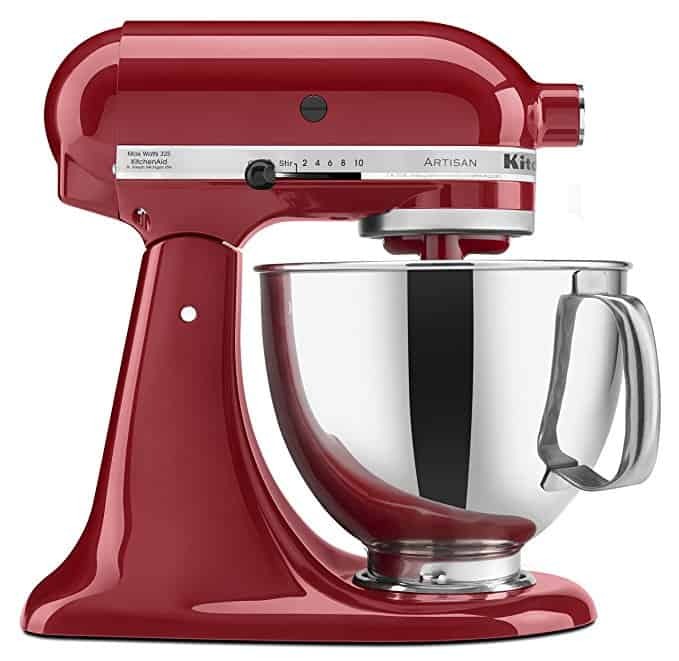 We beat it by hand when I was a little girl, so I really appreciate my KitchenAid mixer! 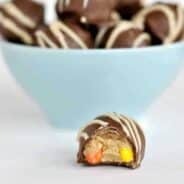 There is one additional requirement, though, that is really a necessity for successful candy making, along with your tips about not making when it’s humid, and using a tested candy thermometer. Use sugar that says that it is pure cane sugar. If it doesn’t explicitly say pure cane, then it’s beet sugar. Beet sugar is fine for other things, but doesn’t work well for making candy. Great tips. And I can’t imagine beating this by hand, oh my gosh! I always make this for my Christmas cookie trays! Definitely trying this recipe soon! I’ve made this and it’s just like my grandma’s! I’ve never had divinity candy either, so I have nothing to compare this to — but it’s delicious! So delicious! Thanks so much for sharing! So delicious!!! Each piece looks so light and fluffy. I’ve heard of divinity but I’ve never tried it. It sounds super delish! My grandmother used to make this every holiday season, but with mini chocolate chip instead of the nuts. So yummy. LOVE the idea of chocolate chips!! Beating until it looses its shine is the best tip ever. If it’s still glossy it will not set up and will be sticky. Wish I had known this before making my first batch. Thanks for the tip. This was my first shot at making Divinity and I must say it came out just perfect! This is due to your excellent instructions!! I have always love divinity but never had the guts to make it. Thanks for the recipe and great, detailed instructions. I’m so glad to hear it 🙂 Enjoy and happy holidays!